When one thinks of the most typical Valentine's Day gifts, chocolates immediately come to mind … and not just every day chocolates, but boxes of beautifully presented, specialty chocolates that, when given, will communicate love at best, or fulfill cultural expectations at least. According to a 2009 Nielsen report, Americans purchased around 58 million pounds (over $345 million USD) of Valentine's Day chocolates prior to the holiday! Although chocolate has a long history of notoriety, there is a bitter side to its ‘sweet’ story. Just as slavery is known to exist in the production of cotton, steel, oriental rugs, diamonds and silk, cocoa production also lends itself to exploitative labor. Child labor and bonded slaves are often used in the harvesting of the cacao pods. According to a US government-funded study, over 1.8 million children work in West Africa’s cacao industry. Many of these children are subject to unsafe working conditions. This unsavory reality has stirred activists and businesses alike to seek solutions. Consumers who wish to enjoy guilt-free treats now have many options available to them. Possibly the easiest way to ensure that your chocolate is ethically produced is to buy Fair Trade certified products. The Fair Trade certified label guarantees that the farmers who were involved in growing the raw materials in your chocolate receive fair prices for their crops. It also ensures that slave labor and child labor were not used during the production cycle. You can check out Fair Trade USA’s website for a list of chocolate manufacturers. It is important to note, however, that there are companies making ethically sourced produces that, for financial reasons, choose to forgo the Fair Trade certification process. These companies may choose to develop relationships directly with farmers, monitor their own supply chain and label their products ‘direct trade’ or ‘ethically’ made. The benefit of direct trade, some argue, is that producers can pay higher prices to farmers due to the savings incurred by not going through the certification process. While we at deliberateLIFE are strongly in favor of producers receiving the best possible price, we do encourage supporting companies that undergo external evaluation of their supply chain to maintain transparency. Note: Organic products are definitely better for the environment and for one’s health, but it’s important to note that ‘organic’ is not synonymous with ‘slave-free’. 1: Moderation, moderation, moderation – From the Thanksgiving table to office parties, unhealthy foods are likely to surround you this holiday season. When you decide to indulge, keep the portion small and really enjoy it – remember, one cookie will not add the pounds, but the same can’t be said for frequent treats throughout the holiday season. 2: Save Splurges for the Best – Avoid eating foods that don’t make the grade – if something indulgent isn’t great, put it down and save those calories for something that you can really savor. 3: Be Alcohol Aware – Not only does alcohol contain calories, but the more you drink the less likely you are to make good eating decisions. Try alternating alcoholic and non-alcoholic sugar-free beverages (water, unsweetened tea, etc). 4: Be Buffet Smart – Holiday buffets can be dangerous because of the number of high-fat and high-sugar items available. Try to fill ½ of your plate with fruits and/or veggies, ¼ with lean protein, and the remaining ¼ with a starchy side. Decide what you want before filling your plate, so you don’t end up with a scoop of everything! 5: Breakfast is Still the Most Important Part of the Day – It is ok to eat a little lighter during the day if you know you are going to have a big meal in the evening. However, try not to skip eating altogether, which is likely to cause overeating later in the day. 6: Keep Goals Realistic – If you have been working to lose weight, realize that a good goal for the holidays may be to maintain your weight. 7: Keep Exercising – Exercise can help work off those special treats as well as keep stress at bay. From walking with family to making time for your regular exercise routine, regular physical activity is good for mind and body. Allison Evanson, MS, RD, is a Registered Dietitian who works with patients to improve their lifestyle habits for disease prevention, weight loss, and health improvement. Allison helps patients find realistic and sustainable ways to incorporate healthy eating into everyday life. Have questions? Feel free to reach out to her here. I love Thanksgiving. Dipping turkey with stuffing into cranberry sauce is one of my favorites. I must have inherited my father’s affinity for pumpkin pie, too. Legend has it his grandmother made 1 pie for his 4 siblings, and 1 pie for just him. Few moments are as blissful as the post Thanksgiving lunch slumber/coma on the couch where tryptophan intoxication enables me to nostalgically construct my Christmas wish list (I’m in my 30s), with some irrelevant football game in the background. Then there’s the scale on Monday afterwards—talk about a walk of shame, from couch coma to that electronic reality checker. When I was younger (20s and below), I didn't gain much weight despite competing in the annual family Overeaters Anonymous competition at our holiday table. But once I passed 30 and the ol’ metabolism changed, I could literally see the turkey migrate from my stomach to setup a semi-permanent residence on my belly. Interestingly, studies have shown that many people aren’t aware that they’ve eaten too much until one thing—they have to loosen their pants. Literally. Until we have eaten so much that we no longer fit in our regular clothing. Did I miss anything? Maybe you have other wants. Sharing stories with loved ones. Enjoying a day away from your desk to reconnect with friends. Taking part in the ritual of flag football. It would be relevant to consider what would define an enjoyable Thanksgiving. Can we have it all? Is there a way we can both enjoy food, the time AND not gain weight, not feel hungry or guilty about it? I think the answer is yes, there are several things you can do to limit the weight gain without losing the things we really want, like enjoying food. FACT #1: IT TAKES 20 MINUTES FOR YOUR STOMACH TO SIGNAL TO YOUR BRAIN THAT YOU ARE FULL. Think about that for a minute. If you are eating for 40 minutes and you stop at minute 40 because you are full (and are in your fat pants struggling to breath because you housed more than your share of the dark meat), then the last 20 minutes you’ve been eating, has been past when your stomach was full. In other words, you overate for 20 minutes! So what can you do to counter this? Eat more slowly. What if you spread out that first 20 minutes of food—over 40 minutes or an hour? You can savor eat bite of bird instead of inhaling it. Focus on socializing and conversation, enjoying the moment with people. Space out bites by drinking water. Pace yourself by eating more slowly than the slowest person at the table. Try asking questions of your fellow diners. Who has a great story that will engage the entire table? Because eating more slowly does 2 things: 1) Enables you to feel fuller and therefore eat less overall and 2) Enables you to more efficiently digest your food, and store a little less as fat. How would you do that? How would you suggest your family do that, or even—how would you model the behavior of eating more slowly for them? What about our criteria for what we want from our meal? Have we compromised? By eating more slowly, can we still enjoy food and people? Yes, arguable you can get MORE enjoyment from savoring food and eating more slowly. Can we do it in a way where we are not hungry and don’t feel guilty about what we are eating? Somehow I don’t think we are going hungry at Thanksgiving, and in terms of the guilt—eating more slowly should actually make you feel BETTER and LESS guilty. If anything, this enhances several aspects of what most of us want to get out of the gathering. Yes, you are a genius. Now, is The Wizard of Oz still the traditional Thanksgiving movie? FACT #2: WE EAT WITH OUR EYES, BUT FEEL FULL ON VOLUME. In the book The Volumetrics Eating Plan by PhD Barbara Rolls, she discussed how you can make a ¼ hamburger look like the same amount (visual volume) as a ½ hamburger—by adding fixings to bulk it up—yet have significantly less calories. Here’s the crazy thing—neither our eyes nor our stomach’s can tell the difference, and we feel just as full, even though we’ve consumed less calories. Suppose just for a second, that’s true. How can you use that info—that volume not calories fills us up—to enjoy Thanksgiving eating and not gain/minimize weight gain? One way would be to fill your plate with more calorie light (not calorie dense) foods that take up space but don’t have a lot of calories. 1 cup of mixed greens for a salad is 20 calories, whereas 1 cup of brown rice is 216 calories, over 10 times that of the greens. I’m not suggestion you don’t eat the good stuff, but I am saying that adding some calorie light food to fill your plate next to and around the good stuff might help you actually overeat less. Regardless of how you stack your plate this Thanksgiving, I encourage you to be mindful about what you're enjoying. Pay attention to how your body is actually feeling, so your pants don't have to tell you. Dr. Larry is residency trained and board certified in Family Medicine. He currently practices as an emergency physician, hospitalist and in the ICU. He is also the author of the forthcoming book The Gentleman’s Diet. You can learn more about Dr. Larry's take on healthy eating and exercise at www.doctorlarry.com. Winter brings more than just shorter days and colder temperatures. This time of year also presents an opportunity to expand your food horizons and get your taste buds excited for all the variety the season has to offer. Eating seasonally increases your overall health by nourishing your body with an array of essential vitamins and minerals. Additionally, choosing seasonal foods helps to promote sustainable food practices and has less of an impact on the environment. So, how do you know what’s in season? Here are some clues that will help when you are shopping at your local grocer. Price, quantity and source country are a good place to start. You’ll notice your favorite summer delicacies like strawberries and stone fruits have a very small presence in the produce section, have nearly doubled in price or are missing from the store altogether. When items like fruit are out of season, they are often flown in from more tropical countries, increasing the fruit’s footprint and decreasing its nutritional value. If you need nonseasonal items, look for those that have been grown in countries closer to home. Another way to ensure you’re getting what’s in peak season is to sign up for a community-supported agriculture (CSA) membership. These services work with nearby farms to select and share produce that is grown locally and seasonally. Although you typically don’t get much choice of what foods you receive, rest assured you’ll be in for a culinary adventure that will encourage you to include the freshest, most seasonable ingredients in your cooking every week. The ultimate way to find out what’s in season is to take a trip to a few local farms. Not only will you get the freshest produce possible, you’ll also be supporting your local economy. Not up for the drive? Find out if your city hosts a local farmers’ market, and opt to buy your fruits and veggies there instead of from the grocery store. Here’s a mini cheat sheet to get you started. Broccoli: Although it’s available year-round, broccoli is at its peak in the cooler months. Brussels sprouts: If you can, buy sprouts on the stalk; they’ll last longer and taste fresher. Endive: Great for salads or stuff with pear and blue cheese for an easy, beautiful appetizer. Pumpkins: Use the meat of the pumpkin for soups or baking and the seeds for an easy treat. Snow peas: Add crisp snow peas for a dash of green in your vegetable stir-fry. Spinach: Winter spinach is greener, leafier and tastier. Squash: Acorn, butternut, spaghetti—each one has a different, delicious taste and texture. Sweet potatoes & yams: Try baking a whole potato or yam as a filling, low-fat snack. Apples: Fall and winter provide a delicious assortment of apples from honeycrisp to Granny Smith. Cranberries: Let cranberries be more than just a side dish to turkey this year. Grapes: Stick with red grapes throughout the end of the year for the sweetest flavor. Kiwis: Even though they may remind you of tropical islands, kiwis are ripest during the coldest time of year. Pears: Bartlett, d’anjou, bosc—pears are in their heyday this time of year. Persimmons: Delicious in a salad or mixed in baked goods for a tangy twist. Pomegranates: Add the seeds, which are a great source of vitamins A and C, to a salad, or make a marmalade. Satsuma oranges and tangerines: These easy-to-peel fruits are a great, vitamin C–filled treat. Try eating a different seasonal fruit or vegetable each week and cooking a meal with locally grown ingredients this month. Varying what you eat boosts your immune system and improves your body’s ability to fight cancer-causing free radicals. Along with the health benefits for you and your family, eating locally grown food supports your community’s economy and has positive implications for the environment, which affects our global community too. This post is a reprint from the inaugural Issue no. 1 available in our store and in the iTunes store. For more excellent, helpful, and thoughtful content like this and so much more, subscribe today. The latest and greatest buzz these days in restaurants is the "farm to table" experience where you can feel as if your food was hand-picked moments earlier. For us, it actually was. Typically, the chef will construct dishes based on whatever food is available in that season locally, as well as garnishes and variations he comes up with himself. 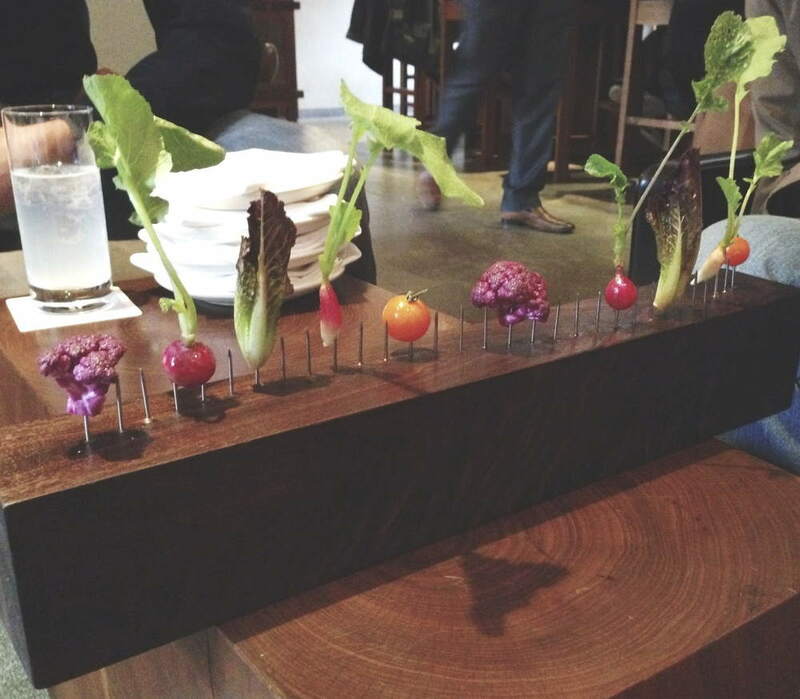 When you eat farm to table, you know that the food you're served is as fresh as it comes. It wasn't any different on a cloudy day up in Westchester County, New York. We took a day trip to Blue Hill at Stone Barns. This farm is enchanting, and free range chickens and turkeys roam the fields. As you walk through the greenhouse, a farmer herds sheep behind you. When you work up an appetite, they have a restaurant on site that sources all the ingredients from their fields and pastures. This restaurant includes dishes such as "The Fence", which is a long, elegantly stained beam with the morning's vegetables nailed to it. After this, you can enjoy dishes like one consisting of home-made pesto and greens you cut yourself. This interactive dining experience not only allows you to feel good about the food you are consuming, it brings an added, earthy awareness to your everyday food choices. Not only can you know where your food came from, you can walk the fields and scatter the animals. While Blue Hills at Stone Barns is the ultimate farm-to-table, since the tables are on the farm, it's easy to find a good farm-to-table experience nearby. If there's no restaurant like this near you, why not do it at home? We thought it would be a great way to be deliberate by picking up some fresh, local ingredients, and re-creating a farm to table experience at the house so that we can share it with our friends. Happy farming everyone, whether you go out or stay in. Grinding your own grain - simple, healthy, even beautiful. There’s a lot of buzz around buying whole grain flour, bread, cereals, etc (which are much better than traditional “white” flour products.) As it turns out though, we’re still missing out on significant nutrition and flavor benefits, unless we actually grind the grain ourselves. Within 24 hours of grain being milled (broken open and exposed to air), 40% of all micronutrients, vitamins, and minerals are lost. By 72 hours, this is up to 90%. By grinding your own grain right as you need it, all these nutrients are still intact! Natural wheat germ oils also don’t preserve well on the store shelf, becoming rancid and bitter tasting. Grinding your own grain delivers the freshest and best possible taste! If you need help convincing your spouse, roommate, (or yourself), the LA Times makes a detailed case in “Flour Power: The joy of grinding your own”. There are many types of grain you can try grinding at home: white wheat, red wheat, spelt, kamut, buckwheat, oats … even rice and lentils. One of my favorite recipe and how-to sites is Bread Beckers, so you can put your new flours to the test. And you can find some electric grain grinders with stunning looks. I LOVE my Komo Magic. It's lovely to start a day. To start this day. The weariness of the night is gone; the dawn brings a fresh perspective and clarity. Some days. Most days, as we all know, start out something like the above idyll, but need a little umph, a little morning chutzpah we call coffee. For a smidge over half of Americans, coffee starts our days off right. Whether it's a spouse blindly hitting the grinder at five a.m. or it's you sauntering Saturday-morningly down to your kitchen to crank your lackadaisical Porlex, the smell of crushed beans and sweet steaming water filtering through them is a true American ceremony. Coffee's ubiquity is deceptive. What coffee are you drinking? Will it be here forever? Kew Gardens's recent Vimeo release indicates that our world coffee supply lacks genetic diversity. No problem? Think again - this, combined with forces of rising temperatures in Ethiopia (you'll have to see the film to understand the full importance of this country) puts the existence of coffee as we know it in danger. We don't like scare tactics here at Deliberate Life, but a lack of deliberation could mean that more than half your friends will be inhuman for days, and you'll have to Porlex pepper one of these days. Seriously, though, it's something to consider - coffee is not only essential creative and cultural sap for Americans or Parisians or Turks, it's a global industry which supports thousands of people and their families as this documentary by TwentyTwenty Studios reminds us. Fair Trade certified coffees and the direct-buy movement in coffee houses (especially, it seems, in third-wave shops) make supporting these sustenance coffee farmers possible, but remember that you, the consumer, have the choice. It's you, pal. Think about this next time you sip a lovely cup of joe. Ask your barista where his house gets the beans. Sustainable living is possible, especially on this daily level, which might seem small until you think about how many people drink coffee and how often. Live deliberately, even early in the morning. What better summertime treat than popsicles? Homemade popsicles are easy to make and a fun activity to involve your children in. Choosing local organic ingredients can also make them quite healthy! Combine all in saucepan on low heat until cocoa is melted. Pour into molds, add sticks and freeze at least 4 hours. Combine all in a food processor or blender and blend until smooth. Pour puree into molds and put freeze at least 4 hours. Blend both in a blender or food processor, pour into molds and freeze at least 4 hours. To make striped or multi-flavored popsicles, let each flavor freeze for 1 hour before adding the next. Don’t forget to add your stick! We used Tovolo’s groovy popsicle molds, they’re BPA free, eliminate the waste of throwing away popsicle sticks and have a drip catcher. The growth of early spring blooms, sprouts, and swells into abundance in late spring and early summer, bringing copious amounts of fresh fruits and veggies to our tables. You might notice a difference in the amount and variety of produce coloring the aisles of your local grocery stores and farmers markets. Apples and oranges are no longer the only fruit available—they are joined by nectarines, peaches, strawberries, blueberries, cherries, and others. A lovely array of vegetables also enters the scene, opening up the door to exciting summer salads and a diverse range of vegetable dishes, from a summer squash salad to stuffed gypsy peppers. To help you prepare healthy in-season fare for your family and friends alike, we spoke with the head chef at Oakland’s Boot and Shoe Service about what you might enjoy this season. A weathered wood haven for early morning risers and afternoon lunching locals, this café restaurant is one of the growing number of eating establishments that are dedicated to using fresh, local, organic ingredients to make dishes that change with the seasons. Started by the owner of Pizzaiolo and former kitchen aide at Chez Panisse, Charlie Hallowell, Boot and Shoe has a similar, if not the same goal as both those restaurants —to take ingredients from the community and transform them into delicious fare for the community. Drawing from the Slow Food Movement, the people at Boot and Shoe Service strive to follow the Slow Food mission to, “counteract fast food and fast life, the disappearance of local food traditions and people’s dwindling interest in the food they eat, where it comes from, how it tastes and how our food choices affect the rest of the world.” This mission does not have to be confined to the restaurant world—each and every one of us can apply the philosophy of the Slow Food Movement to our own lives and eating habits. Taking time to make a meal and then sit down and enjoy it makes a great difference in the quality of our lives. Whether we enjoy food by ourselves or in the company of those we love, we should appreciate what nourishes us. By eating local, organic foods, we help to protect both our health and the health of the environment by reducing our carbon footprint and avoiding the chemicals in pesticides that are harmful to our bodies. In order to live deliberately, we must eat deliberately. Asparagus Harvested from March until June, depending on geographical location, these tasty spears are wonderful steamed, boiled, or sautéed. Available in white or green, asparagus stalks vary in width, but you may be surprised to find that the thickness does not correlate directly with their tenderness. The asparagus’ tenderness depends on how the plant is grown and how soon it is eaten after it has been harvested. They are wonderful steamed, boiled, or sautéed. Marc Baltes recommends serving them roasted or grilled with mustard vinaigrette, hard cooked eggs and bits of pancetta. 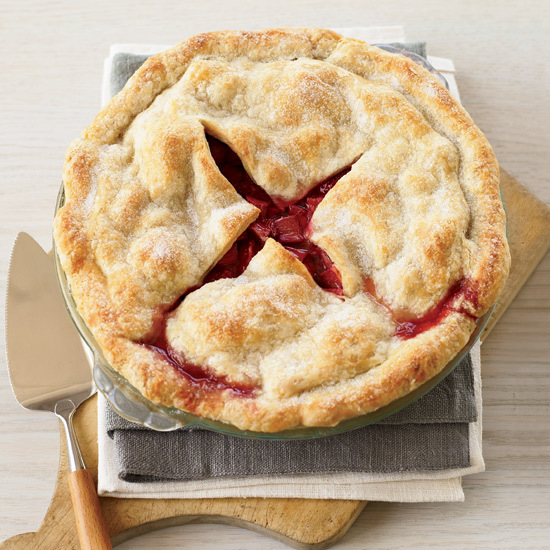 Rhubarb Known for its tart taste, this sour stalk acts as a great pairing to sweet fruits like strawberries and cherries. Put it in a pie, make it into a jam, or turn it into chutney. For the freshest rhubarb, look for heavy crisp stalks with shiny skin. Cherries Cherry blossoms turn to cherry fruit at the end of spring, which means you can enjoy these sweet, antioxidant and melatonin-rich treats at the beginning of summer. While sweet cherries, like Bing or Rainier, can be found from May to August, sour cherries have a much shorter season, and are only available for a week or two, usually during the middle of June in warmer locations and as late as July and August in colder areas. Have a pit-spitting contest for fun! Mint This herb starts to thrive in the spring and adds a refreshing taste to fruit or veggie salads and iced drinks or cocktails. At Boot and Shoe, Baltes tosses whole leaves of mint with arugula, drizzling it with olive oil and balsamic vinegar to make a simple, but delightful salad that goes great with their buttery avocado toast and marinated beets. He also recommends adding some feta to the salad for a little extra richness. Nettles Rich in iron, these dark leafy greens can be found at farmers’ markets sold by foragers and farmers. In some regions, they may be growing as "weeds" in gardens. Purée them into a soup or make a sun tea by plunging them into hot water and letting them sit in the sun while their nutrients seep into the water. According to Baltes, you can also wilt them quickly in a hot pan, squeeze out the water, chop them up coarsely, and mix them into beaten eggs for a bright green frittata.